In shallow dish, mix flour, paprika, salt and pepper. Coat chicken with flour mixture. In 12-inch nonstick skillet, heat oil (1/4 inch) over medium-high heat. Cook chicken in oil, skin sides down, about 10 minutes or until light brown; reduce heat to low. Turn chicken skin sides up. Cook uncovered about 20 minutes, without turning, until juice of chicken is clear when thickest pieces are cut to bone (at least 165°F). If you’ve got a large cast-iron skillet, put it to good use. A well-seasoned skillet is meant for pan-frying chicken, with no sticking. For a country-style fried chicken, dip the chicken pieces into buttermilk before dredging them in the seasoned flour. Cook the chicken until the juices run clear when you cut the thickest pieces to the bone. The internal temperature should be 165°F, which is easiest to check with an instant-read thermometer. If you prefer skinless chicken, go ahead and use a paper towel to grip and pull off the skin from each piece. The chicken will still be moist and tender, especially since it will be cooked on the bone. Use medium-high heat to brown chicken. For the best browning, the skillet should be hot when you add the chicken. Let the chicken cook on one side without turning. When it is properly browned, it should release from the pan without sticking so the other side can be cooked. There was a time when just about every cook had her own special fried chicken recipe, especially throughout the South. 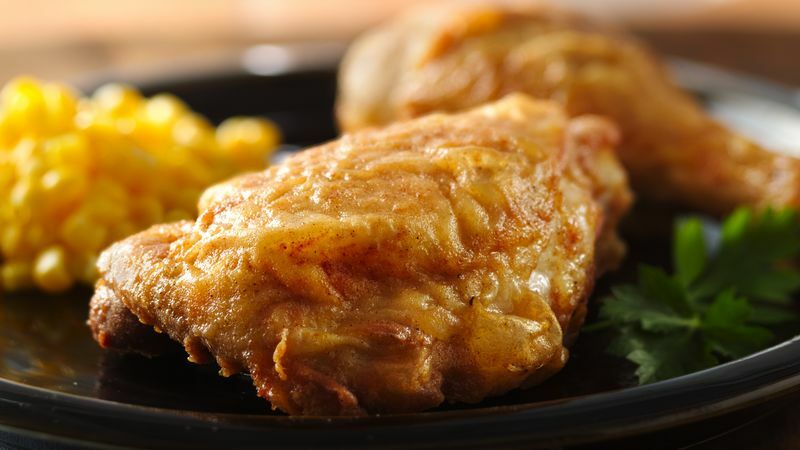 These days, many folks have lost touch with the tradition of serving fried chicken for Sunday dinner, but it’s a treasured practice that is certainly worth a revival, no matter where you live. Invite everyone over for a chicken dinner, and then serve up this easy, ready-in-under-an-hour version. What to serve along with it? Keep things easy on yourself and ask your guests to bring along the sides and salads. A post-walk stroll for ice cream cones might be the perfect capper to your old-fashioned meal. Now that this recipe has taught you how to make fried chicken, you can find more delicious, quick-fix chicken ideas in Betty’s collection of best chicken recipes.